Apple has its iPhone, and now phones are 'Made by Google' too. The phones will be available for pre-order starting today, however -- at least at first. For now, the only US carrier selling them directly will be Verizon. Otherwise, you can buy the device unlocked (via the Google Store or other retailers) or for use with Google's Project Fi service. The price starts at $649, and you can have one in "Quite Black," "Really Blue" or "Very Silver." Built with a 12.3-megapixel camera, Google claims these phones notched the highest-ever rating for a phone ever on the DxOMark test, with a score of 89. (If you're keeping score, the iPhone 7 was rated an 86, while the iPhone 7 Plus has not been reviewed yet.) Software lead Brian Rakowski didn't stop there, claiming the Pixels also have the fastest capture speed of any phones tested, while Google even pointed out that unlike the iPhone (and the Nexus 6P) there's no camera hump here. Finally, since it comes with Google Photos built in, with the promise of unlimited photo storage for your pictures and video, and at their full, original resolution, no less. The Pixel has a 5-inch display, while the Pixel XL's measures 5.5 inches, and they're both powered by Qualcomm's Snapdragon 821 chips. 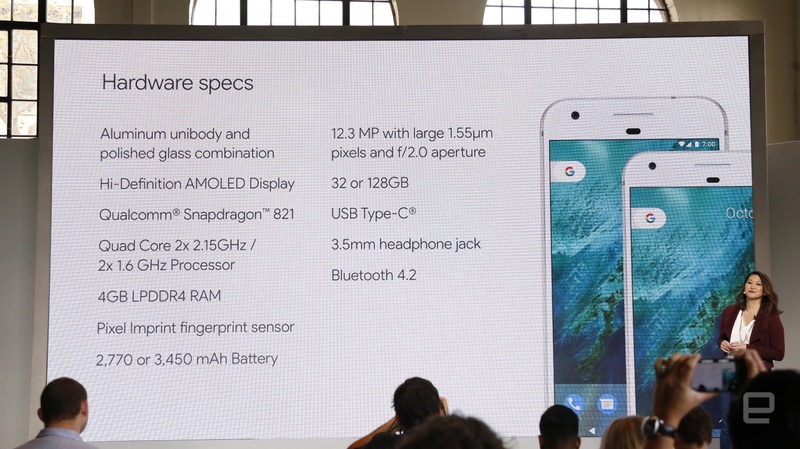 In addition to those 12.3MP cameras, they have 4GB of RAM plus either 32GB or 128GB of onboard storage. Google said both will feature a "high resolution" AMOLED screen and yes, there is a headphone jack. The difference (aside from screen size) is that the Pixel XL has a larger 3,450mAh battery. The official spec page confirms the rumors of different displays: The Pixel has a 1080p screen, while the Pixel XL steps to Quad HD. The best news, however, is that with Pixel's fast charging over USB-C, you should expect seven hours of battery life from just a 15-minute charge. The first demos onstage at today's keynote focused on the software -- specifically how it can respond to a user based on what it knows about their app preferences and provide relevant information in response to a question. Google's AI "Assistant" is activated either by pressing and holding the home button, or starting a query with "OK Google." Pixel Imprint lets you swipe down on the rear-mounted sensor after unlocking the phone to easily reveal your notifications, while the Duo app is built-in for easy video calling. The phones also come with a "Quick Switch Adapter" cable to transfer your old data to the new phone, including texts and iMessages. Built-in customer support software will bring help 24/7, with a screensharing feature so reps can walk you through any necessary troubleshooting. With Android Nougat 7.1, software updates are seamless and quick, and Google says the phone will continue receiving them for at least two years. The pre-order page is now available (all traces of Nexus phones have disappeared from the store) and reveals that upgrading to a Pixel XL will add $120 to the price of the 32GB base model. Opting for 128GB of storage adds an additional $100, while two years of device protection is another $100 add-on. That puts the price of an unlocked 128GB Pixel XL at $869 -- the same price as a similarly outfitted iPhone 7 Plus (a 32GB Galaxy S7 Edge on Verizon costs about $793 with expandable storage via microSD slot). Now the choice is up to you.